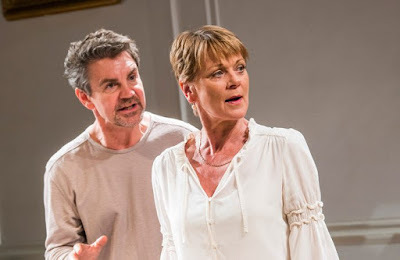 Last Saturday night Stuart and I went to see The Lie at the Menier Chocolate Factory in London's glitzy London Bridge Quarter. Florian Zeller’s The Lie (Le Mensonge) is the most amazing night of comedy we have ever had in the theatre. But it’s not. But it is. But it isn't. And if you believe that you're believe anything. Or you won't. Because it's rubbish. No, it’s great. But it isn't. And if you find the strategy of characters in a play making an assertion, then contradicting it, then undermining that contradiction irritating then maybe The Lie isn’t for you. We simply hated it. We really did. "So that is what you want me to believe then, is it?" "Yes, that is what I want you to believe"
"But why is it so important that I believe what you are saying to me?" "Because I want you to believe what I am saying to you and it is important to me that you believe what I am saying to you"
They all had affairs with each other. There, you know the ending now. Save yourself the money.